With Jen and I coming from distinctly French-Canadian backgrounds we both have some sort of rudimentary knowledge of Shrove Tuesday, Fat Tuesday, Mardi Gras, or whatever you want to call it. With that happening today it was time to celebrate! Traditionally one is supposed to use up items from their fridge that they are going to give up for Lent such as eggs, butter, and meats for a Shrove Tuesday meal. 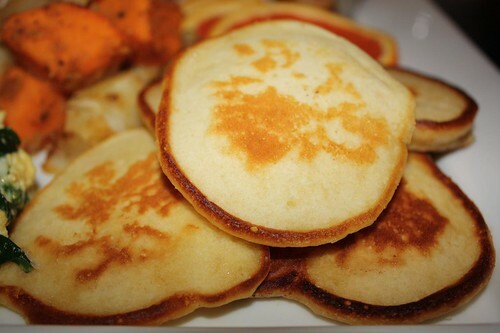 This developed into the traditional eating of pancakes (which are generally more like a cross between a pancake and a crepe) to use up these ingredients. In the United Kingdom it was a common Anglican custom to celebrate with pancakes. Our own tradition has morphed this into becoming a day to have breakfast for dinner. This kind of contradicts the original point of the holiday because it generally involves us purchasing things and bringing them into our fridge rather than trying to clear them out. Also there is the fact that we have no intention of giving anything up for Lent. Except possibly cucumbers. I could give up cucumbers for Lent. 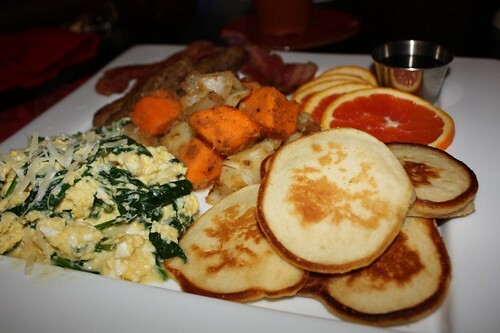 I made some silver dollar pancakes, eggs (which actually was to get them out of the fridge) with spinach and Gruyere Surchoix, bacon, sausage, sweet potato home fries, and Cara Cara orange slices. 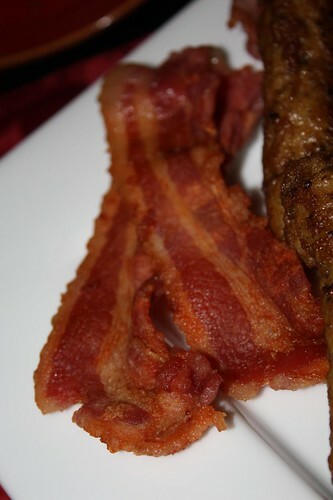 Jen likes her bacon extra crispy (or as I call it "ruined") so I generally have to stick a few strips in the microwave for ten or twenty minutes before serving them to her. I, on the other hand, prefer mine to be cooked to a nice medium rare. We are both disgusted by the other's taste in bacon cooking procedures. 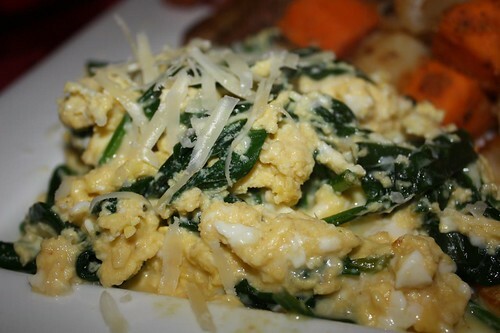 The scrambled eggs were a triumph. I used up some almond milk and skim milk, a seasoned them only with salt, pepper, and shredded Gruyere Surchoix. I don't mean to brag, I don't mean to boast, but I'm intercontinental and I make the world's best pancakes. (Also used a half and half almond/skim milk combo in this). 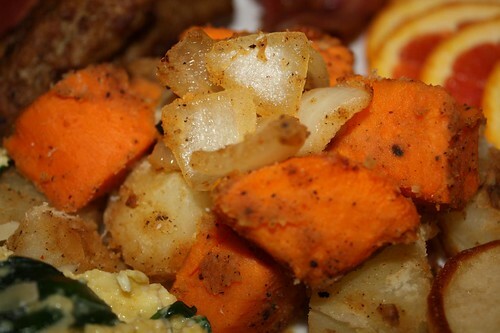 The home fries were in the spirit of the Shrove Tuesday (sort of) in that they did clean something out of the fridge -- an excess of potatoes and sweet potatoes that have been hanging around for some time now. It turned out well. I cooked them in the rendered bacon fat which generally adds +10 goodness to just about anything. I tried something new this year: beer for breakfast! 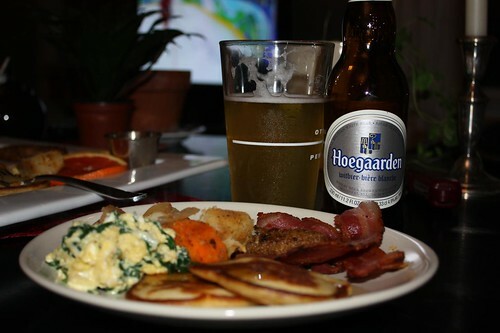 I wanted to have the perfect beer with breakfast and it turns out the Hoegaarden works pretty well. Of course if you're having "breakfast" at 8:00pm you have a little more leeway in this area. I'm probably not going to crack another open tomorrow morning when I make my oatmeal. 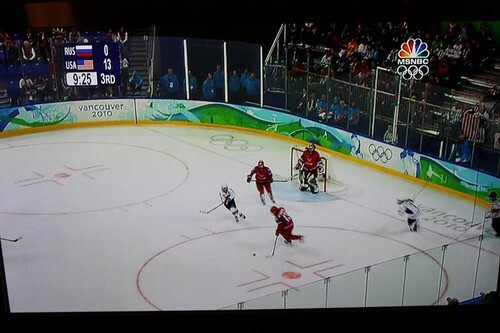 Also, another tradition, is to watch the US Olympic Woman's Hockey Team soundly defeat their Russian adversaries. It's like the miracle on ice except without any of the suspense. And thus a Shrove Tuesday tradition was born. One that we will repeat every four years on Shrove Tuesday. Assuming the Olympic schedule stays exactly the same. And that we remember. Which we most certainly won't.